Found as the 5th book in the New Testament, the Book of Acts can best be split into two parts; the first part dealing with the home church and its mission and the last concentrating on foreign missions. The book begins with the Ascension of Jesus and goes on through Paul’s jail time in Rome, which opens his ministry to the church at Rome. In this book we see the first mention of the dispensation of the Holy Spirit and Jesus’ command to take His gospel to all the world. Here is a summary and overview of the Book of Acts. Peter and his mission to the Jews is the main focus in this first part of the Book of Acts. Acts 1:4–8 And, being assembled together with them, commanded them that they should not depart from Jerusalem, but wait for the promise of the Father, which, saith he, ye have heard of me. For John truly baptized with water; but ye shall be baptized with the Holy Ghost not many days hence. When they therefore were come together, they asked of him, saying, Lord, wilt thou at this time restore again the kingdom to Israel? And he said unto them, It is not for you to know the times or the seasons, which the Father hath put in his own power. But ye shall receive power, after that the Holy Ghost is come upon you: and ye shall be witnesses unto me both in Jerusalem, and in all Judaea, and in Samaria, and unto the uttermost part of the earth. Acts 1:10–11 And while they looked stedfastly toward heaven as he went up, behold, two men stood by them in white apparel; Which also said, Ye men of Galilee, why stand ye gazing up into heaven? this same Jesus, which is taken up from you into heaven, shall so come in like manner as ye have seen him go into heaven. 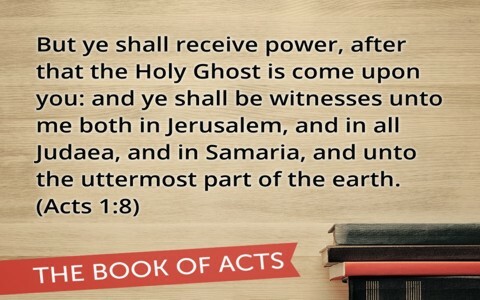 Acts 2:1–4 And when the day of Pentecost was fully come, they were all with one accord in one place. And suddenly there came a sound from heaven as of a rushing mighty wind, and it filled all the house where they were sitting. And there appeared unto them cloven tongues like as of fire, and it sat upon each of them. And they were all filled with the Holy Ghost, and began to speak with other tongues, as the Spirit gave them utterance. Peter steps out in faith and boldly preaches Jesus as the Christ to the Jews. A pivotal point in the Book of Acts is when Saul of Tarsus (the Apostle Paul) meets Jesus on the road to Damascus and is converted. Philip, Peter and John’s ministry to the Samaritans as well as Peter’s vision at Joppa made it clear that they needed to take the gospel to the Gentiles and confirms that the Holy Spirit is leading them to broaden the mission field. Previous post: What Is Pantheism? Is It A Threat To Christianity? Next post: Who Are the Elect in the Bible?